I added some more pictures of my work area here. It hasn’t been this clean in over a year, and yet I’d be embarrassed to show you the mess looming on the opposite side of the room. After I completed the furniture rearranging and general clean up I was ready to spin up the mill and do something, so I secured a scrap piece of aluminum to the mill and set up the software to cut a 0.2″ deep 1.5″ diameter pocket. Given this was the first time I was running the mill under computer control I set up everything carefully and made many trial runs without tooling. I also set the feed rate very low for the actual operation so it took 45 minutes to complete the operation. Even so, it was terribly exciting! I made a short video clip of three different parts of the operation. The variable lighting was due to the sunlight streaking in the window behind the mill. Hope you enjoy it (click either the picture or here to watch). Oh happy, happy, joy, joy! My Sherline mill is now under computer control! The picture shows my mill with the steppers installed but I hadn’t yet remounted the head stock & motor. You’ll also notice I cleaned up all the aluminum chips! I filled a small garbage bag with debris from previous milling operations. A few weeks ago I ordered a CNC stepper and controller from Xylotex and it arrived last Thursday. It was packaged very well and arrived in perfect condition. I spent the afternoon today installing the Sherline CNC conversion kit and the Xylotex kit. I’d been worried about installing the stepper mount as the directions indicated I’d need to drill and tap holes in my existing mill. 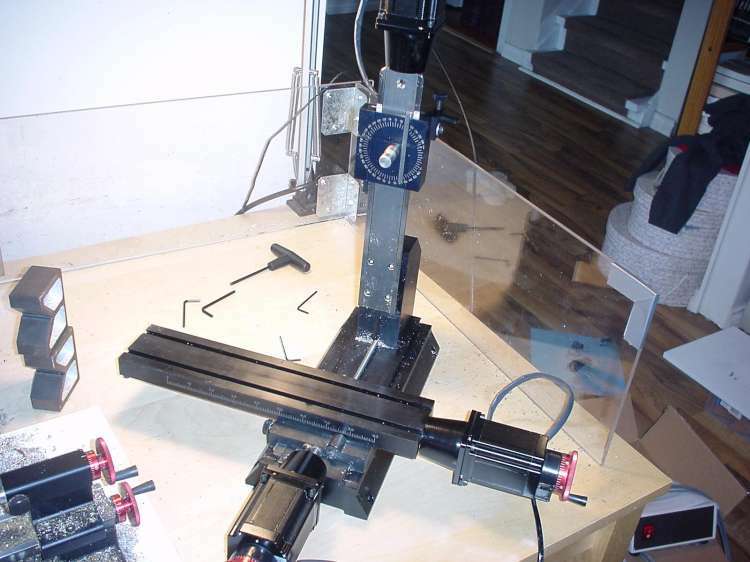 As it turned out the X and Y axis were already drilled and tapped but the Z axis still required the extra work. Overall the installation went smoothly. The Sherline instructions were ok but were a bit light on detail – I guess they expect you to know your mill inside and out, which I really didn’t. I got a good introduction today though, and now I know such things as the X axis lead screw is a right hand thread. The Xylotex kit was pre-assembled so there wasn’t really anything to do except mount the steppers and plug everything together. Of course by itself it doesn’t really do much, as it requires the computer and some software to drive it. I opted to give the Mach3 demo a try based on a recommendation, and so far I really like it. I need to clean up my work area to locate the computer closer to the mill (I’ve got cables stretched around rather awkwardly right now). I ran a few tests to move the steppers around and so far the whole thing is working really, really well. The alternative is EMC which is what Sherline uses in their full CNC mill package. It runs on Linux and has a “live cd” boot image. I took a few photos during the installation, you can see the gallery here. Tomorrow I plan to fix up the work area and try to actually cut some metal. I’ll probably end up purchasing Mach3 as I’ve been quite happy with the built-in CAM tools for simple operations like square or circular pockets. Yippe! It has been a really long time since I posted anything (and maybe longer since posting anything interesting). Work has been really, really busy including a number of evenings at home to finish up the day’s efforts. I’ve been busy with planning the start of a new version for the Sophos Web Appliance. The successful launch of version 2.0 in January caused a fair amount of new investment in the product line. So time for robots and other hobbies has pretty much been suspended because of that, which explains why the Joint Strike Minisumo project hasn’t progressed any further. Eileen and I have recently seen two movies worth mentioning though: In Bruges and The Other Boylen Girl. In Bruges is basically the same type of film as Pulp Fiction, except it is set in Europe and has a strong European flair (and without the great dance contest). It is a really well-made film starring Colin Farrell and Brendan Gleeson and Ralph Fiennes and probably a bunch of other great actors I didn’t recognize. It was shot in the fantastic city of Bruges in Belgium, and we recognized quite a few scenes (we’ve been to Bruges probably six or seven times or so from the time when we lived in Brussels). The Other Boylen Girl is quite different. We debated the film quite a bit and I’d say that the set decorating and costumes were the best part. The script follows the historical facts quite closely but is generally an uninspired tale. The film plods along without a strong central storyline. I’d still recommend seeing it though but don’t get too excited – it isn’t quite the same scale as Elizabeth. The one bright note for my robotics hobby is that I’ve finally invested in a CNC set-up for my Sherline mill. I decided on a package from Xylotex. I’m still waiting for it to arrive in the mail but when it does I’ll document the conversion, including the Sherline CNC conversion package. I haven’t purchased software yet but I’m strongly leaning towards Mach3. I really like the g-code generator wizards for common operations.